This specialist tyre for on and off-road driving is initially available in 21 sizes for 15 to 20-inch rims and in widths from 205 to 275 mm with aspect ratios of between 40 and 80 percent. The assortment is scheduled for further expansion early next year. The CrossContact ATR is approved for speeds of up to 240 km/h and suitable for a wide range of SUVs and 4x4 models. 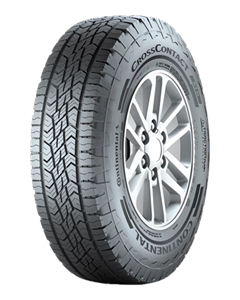 With its on/off-road ratio of 70/30 percent, the new CrossContact ATR is positioned between classic off-highway tires like the ContiCrossContact AT (50/50) and more on-road products like the ContiCrossContact LX 2 (80/20) and PremiumContact 6 (100/0), neatly rounding out Continental’s broad portfolio for the SUV and 4x4 segment. Own the road, no matter what the terrain with Continental's TractionPlus+ Technology. Additional off-road grip through maximised contact area. Enhanced water displacement increases the tyre's traction performance under wet driving conditions. The CrossContact ATR features noise blockers designed to reduce road noise for a smooth and quiet ride. Sorry, we currently do not have any tyres with the CrossContact ATR pattern in stock.